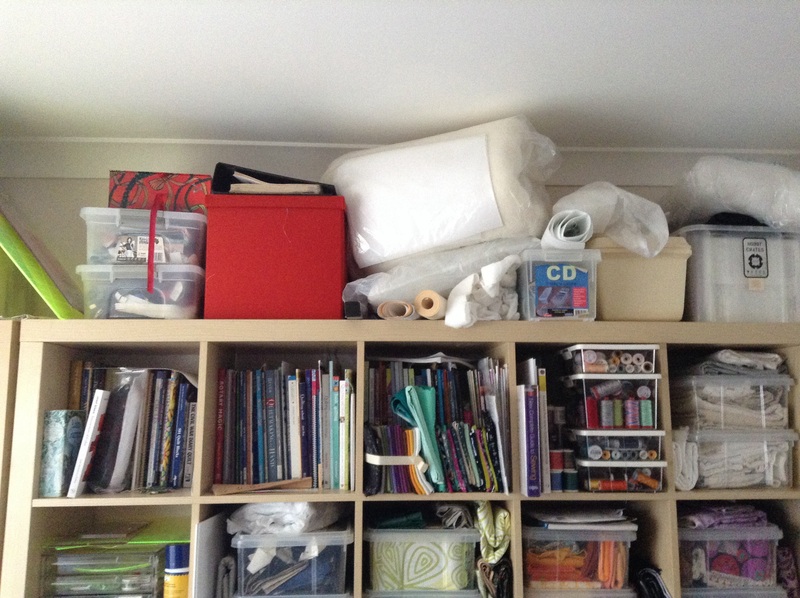 I just cram my fabrics into boxes, close the lids and pretend that the room isn’t utter chaos haha! If you ever find the answer to the mystery of staying organised please let me know!! I will Jenny. I’m sure, given how creative quilters are, that someone, somewhere has a system that works. I don’t know, but if you do find the sewing room organising fairy, please send her to me once she’s finished at your place! Well, I have my fabrics sorted by color in stacking boxes in a hallway in front of my bookcase. I notice the color I want tends to be in the bottom box and the hallway is then one you have to walk through like a crab … sideways. 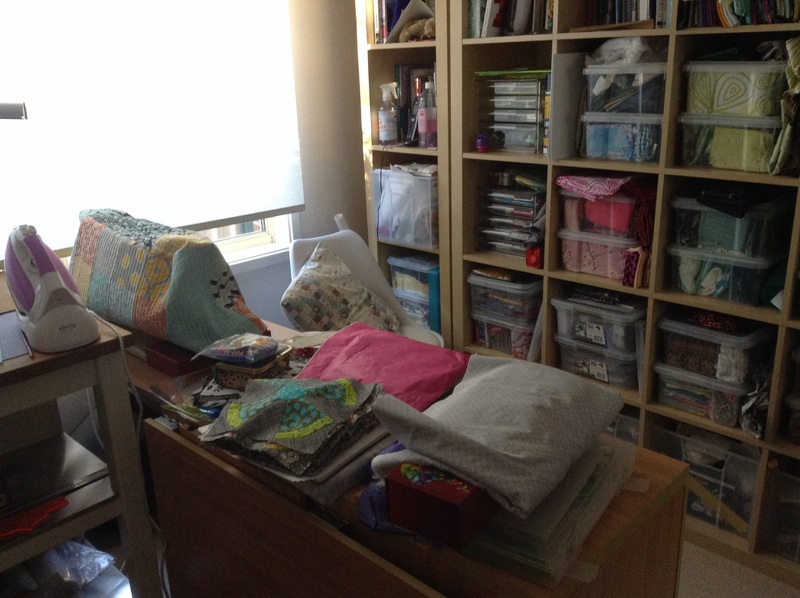 If I had a sewing room it would have shelves for both boxes and books and a design wall … and a big window for lots of light, and a comfortable chair to sit in when I quilt, and a lock to keep my husband and the dog out. … and maybe sticky tape at the door to keep the dog hair at bay. My problem Julie is that I’m indecisive. I can’t work out where to put something so I just pile it on the nearest flat surface. 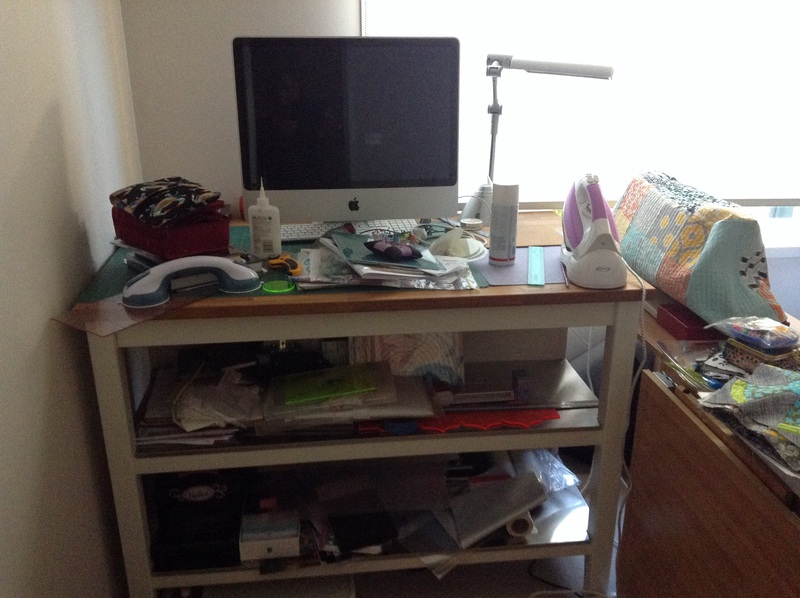 I take your point though, I am lucky to have a sewing room. You are way more organised than I am Doris. The way I have done it now is that I have the major colours (i.e. rainbow) and then I have some collections of FQ’s and things that I want to keep together and I have bought a labeller and labelled the boxes so I can see at a glance what is where.